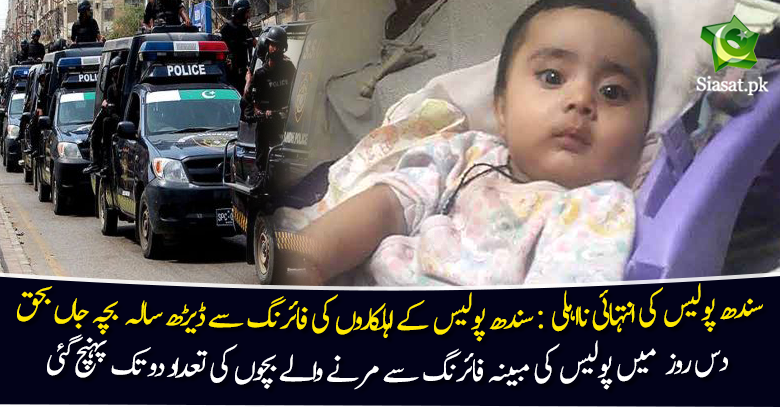 In yet another horrific incident of alleged police negligence during a shootout with suspected criminals, a 19-month-old boy’s cut short on University Road near Safoora Chowrangi on Tuesday evening. Two policemen were detained and investigations initiated after the family alleged that the boy was killed by police firing. Two other cops who were present at scene are also being questioned about the incident. This is a second tragic incident to have occurred in Karachi in 10 days, as on April 6 a 10-year-old boy, Sajjad Khan, died after being caught in crossfire between police and criminals in Quaidabad, leaving so many questions about the police department’s failure to properly deal with criminals on the streets of the metropolis. The latest incident took place near Khalid Bakery located near Safoora Chowrangi within the limits of the Sachal police station. The boy, Ahsan Shaikh, son of Kashif Shaikh, suffered a single bullet wound and died instantly in a rickshaw. The family took his body away with them from the nearby Memon Hospital. The body was later moved to Jinnah Postgraduate Medical Centre for an autopsy. No postmortem had been conducted till the filing of this news story late on Tuesday night. “We were in a rickshaw when we saw the policemen fleeing while resorting to indiscriminate fire,” claimed the victim’s father, Kashif Shaikh. “Moments after we saw blood flowing from my son’s body.” The family immediately took the child to Memon Hospital, where doctors pronounced him dead. He added that the family saw the two cops on a motorcycle fleeing from the scene immediately after the incident. He said his nephew was hit in the chest and the bullet went through the body. As the news of the killing of the minor boy spread in Safoora Goth, a heavy contingent of law enforcers, including Zone East police chief DIG Amir Farooqui, reached the scene and inquired about the incident. Sachal police SHO Javed Abro told The News that the policemen Abdul Samad and Amjad Ali had been detained for questioning to ascertain the nature of the incident and a case would be registered against them if they were found guilty. 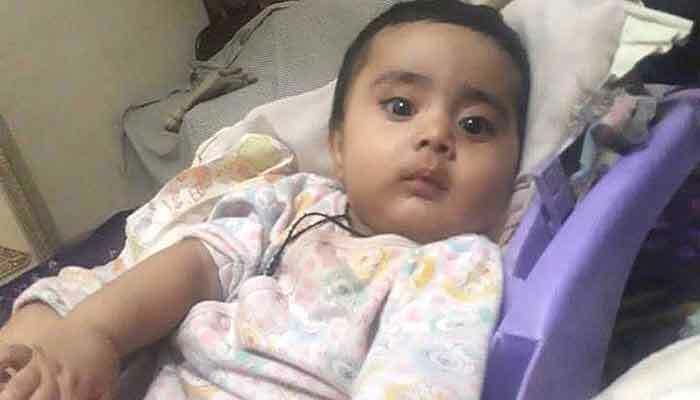 Sindh Chief Minister Syed Murad Ali Shah took notice of the child’s death and sought a report from Karachi’s additional inspector general. “Such incidents are lamentable,” he said in a press statement issued after the incident while expressing condolences with the family. Sindh Inspector General of Police (IGP) Dr Syed Kaleem Imam also took notice of the incident and sought a report from DIG Farooqui. Zaman assured the affected family of his party’s support for bringing the cops to justice. This was the fifth incident in the last seven months in which innocent citizens lost their precious lives during a shootout between law enforcers and criminals on the streets and busy thoroughfares of the city. A 10-year-old girl, Amal, a final-year medical student, Nimrah, a mechanic, Rab Nawaz, and Sajjad have fallen victim to crossfire between law enforcers and criminals in Karachi during the last seven months. Amal was shot during a police encounter in Defence, Nimrah died when she was hit by a bullet during a police encounter in the Sir Syed area, and Rab Nawaz was shot in the Tariq Road area during an exchange of gunfire between paramilitary soldiers and suspects. In the earlier incidents of the killings of Amal, Nimrah and Nawaz, it was initially claimed that they were shot dead by the criminals. However, investigations later revealed that Amal and Nimrah were in fact killed by the police firing. Muslims are not safe in pakistan. Aaro Bharoo and Maroos are Police in Karachi trained for last 30 years by Rangers. Kuttey ki nasl marey hui bachey ki post pe to propaganda kar rha hai? Muslims are slaughtering in the hands of Hindu in Hindustani regime. Thank you Jinnah for giving us freedom from Hindu. Musalman is killing musalmans in the land of pure . They start crying in full volume if any Muslim fights with Hindus and gets beaten , here in Pakistan Muslims are getting killed but nobody thanks Jinnah ..
Innocent pashtun boy killed by police for extortion. Qaim Ali Shah nay kaha hay keh yeh minor boys ko akhir ho kia gia hay? Jahan police muqabla ho raha ho wahan jatay hi kion hein?